Айвазян С.А., Бухштабер В.М., Енюков И.С., Мешалкин Л.Д. Прикладная статистика: Классификация и снижение размерности. -М., 1989. Mills P. Efficient statistical classification of satellite measurements // International Journal of Remote Sensing. - 2011. - № 32(21). 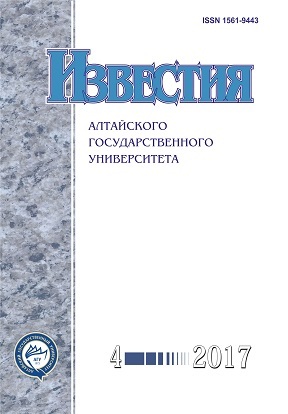 DOI: 10.1080/01431161.2010.507795. Haghighat M., Abdel-Mottaleb M. & Alhalab W. Discriminant Correlation Analysis: Real-Time Feature Level Fusion for Multimodal Biometric Recognition. // IEEE Transactions on Information Forensics and Security. - 2016. - V. 11, № 9. DOI: 10.1109/TIFS.2016.2569061. Straus S., Glasziou P., Scott Richardson W., Brian Haynes R. Evidence Based Medicine. -Elsevier, Churchhill, Livingstone, 2010. Sackett D.L Rosenberg W.M. Gray J.A. Haynes R.B. Richardson W.S. Evidence based medicine: what it is and what it isn’t. // BMJ. -1996. - № 312 (7023). D0I:10.1136/bmj.312.7023.71. McLachlan G. Discriminant Analysis and Statistical Pattern Recognition. - Wiley, 2004. Дронов С.В. Методы и задачи многомерной статистики. - Барнаул, 2015. Dronov S.V., Dementjeva E.A. A new approach to post-hoc problem in cluster analysis // Model Assisted Statistics and Applications. - 2012. -Vol. 7, № 1. DOI: 10.3233/MAS-2011-02-01. Crawford-Brown D.J. Theoretical and Mathematical Foundations of Human Health Risk Analysis: Biophysical Theory of Environmental Health Science. - Springer Science & Business Media, 2012. Fleiss J., Levin B. Statistical Methods for Rates and Proportions. - Wiley, 2003.